This weeks news: All players and mentors are eagerly awaiting the start of the John B Keane League, we wish all players and supporters the very best of luck and hope to have some great evenings of football in Frank Sheehy Park. Training continues next Saturday morning from 10.30am - 12noon, see you all there! It's that time of year again with the excitement at fever pitch as Emmets young hopefulls square off against each other in the 10th annual John B Keane League. This year we have some new referees to keep the boys and girls in check and as always the we will have our annual fundraising table quiz on the night of the finals for our end of season trip in October, hosted by Billy and Mary Keane in John B's Bar. 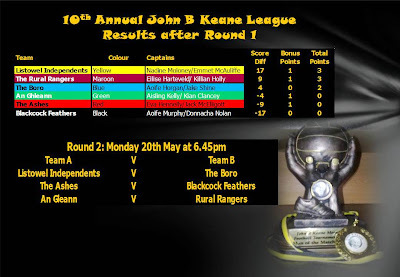 The opening round of the 10th Annual John B Keane League was excitement at fever pitch, see the league table below for results. Round 2: Mon May 20th at 6.45pm. Round 3: Mon May 27th at 6.45pm. Round 4: Tues June 4th at 6.45pm. Round 5: Mon June 10th at 6.45pm. A&B&C Finals on Friday June 14th at 6.45pm with presentation of medals after all finals complete.